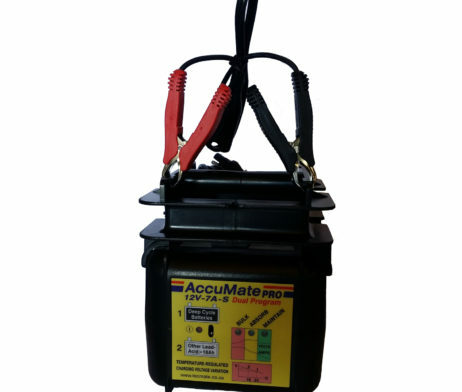 AccuMate PRO 12V 7AH is a versatile automatic compact battery charger for lead-acid starter and deep cycle batteries of minimum capacity 17Ah (12V). Suitable for all types of batteries: filler cap types: absorbed acid “MF” (AGM) for motorcycles, valve regulated (VRLA) & flooded (wet) & GEL-electrolyte types. 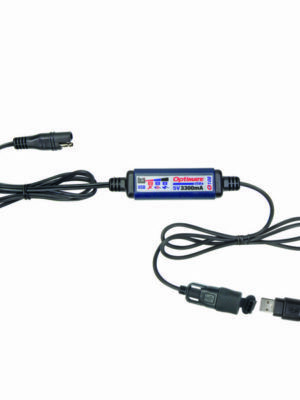 SKU: TM-206 Category: Battery Chargers Brands: Optimate. 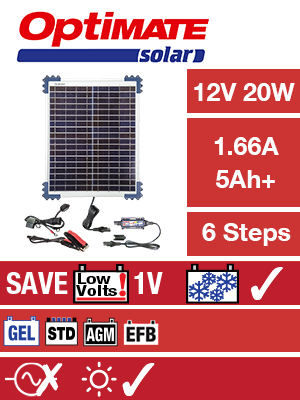 Very easy to use – Select 12V charging output according to battery type, then connect to battery and mains power. The rest is fully automatic. – Keyhole slots on the rear for wall mounting. – Integral electronic protections against short circuits. No fuses to burn. 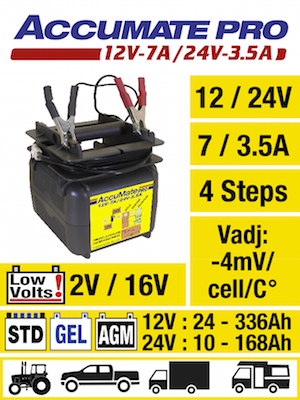 – Approved by ITS to UL & CSA safety standards for battery chargers. – Integrated handle and cord winder for portable use. – Detachable charge clamps. charge cable extensions of up to 15 ft/4.5m for maintaining batteries on vehicles. 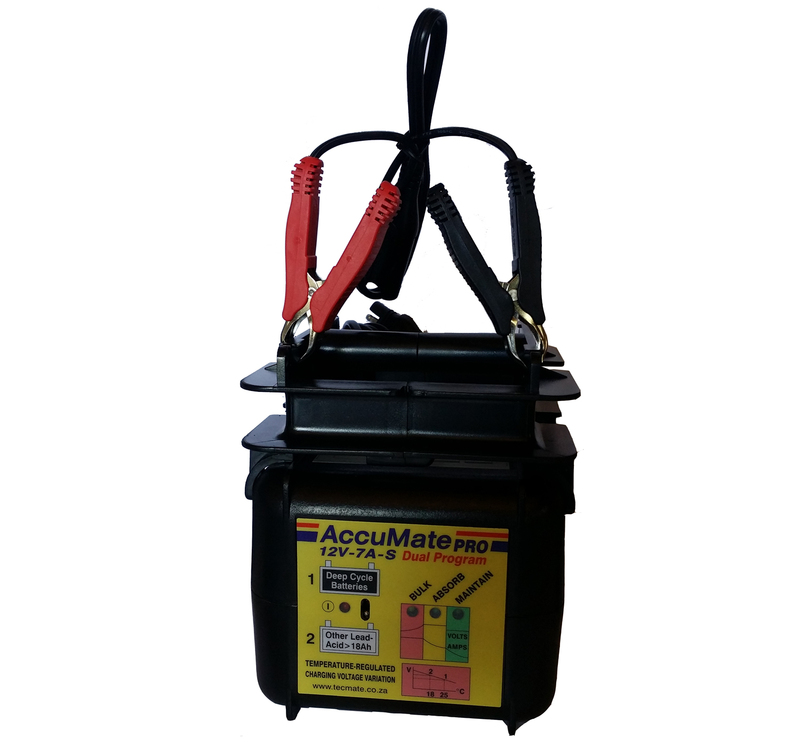 Automatic and safe: Fully automatic smart charger-maintainer for indoor use. No output when not connected to the battery. Short circuit, over current and reverse polarity protection. 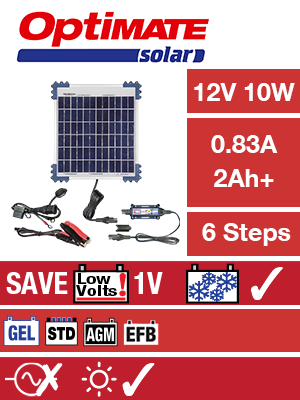 Capability: Simple switch allows this versatile charger to be used on 12V lead-acid batteries.